This summer I’m teaching our department’s capstone course, a seminar in research and writing for which students write long papers on topics of their choosing, sourced by primary materials and grounded in the secondary literature. I do exclude some topics—World War II battles, the assassination of JFK, the Salem Witch Trials, anything too narrative, too big, or that has been done to death, but beyond those considerations, they pretty much have free rein. One of the first times I taught this seminar, more than a decade ago, I had to be much more restrictive, due to the circumstances we all found ourselves in: almost as soon as the semester began our university library was condemned and closed! Teaching a research seminar without a library demanded resourcefulness on my part, and my students: especially in this relatively “dark” time with few databases at our disposal (we obtained a lot more because of the library’s closure, but sadly Salem State cannot afford any of the Adam Matthew databases to which the Peabody Essex Museum has consigned Salem sources from the Phillips Library). I decided that they all had to do local history, and dig into the archives of their hometowns: they were at first resistant, but eventually they did dig in and the end result was a bunch of amazing papers—on trolleys, societies, movements, schools and hospitals, the local experience of the Civil War and World War I, and early efforts to draw tourists to enclaves all around Essex County. I think my students got a lot out of that seminar, but it also taught me a lot: not being an American historian I wasn’t really aware as to what local historical sources were available and of what stories could be told and what stories could not or were not. Since that time, Salem State has opened a new library, the city of Salem has lost its major historical archive, the Phillips Library, first by severe restriction of access, then by closure and removal to temporary and then permanent locations well out of town, and I began writing this blog. Henry Wilder, Map of the County of Essex, Massachusetts. Compiled from the Surveys made by order of the Legislature in 1831-1832, Boston Rare Maps; Ticknor map of Massachusetts, 1835, Leventhal Map Center, Boston Public Library. I no longer insist that my seminar students engage in local historical research—they have many more resources available to them now–but I encourage it, and many of them choose to do so. 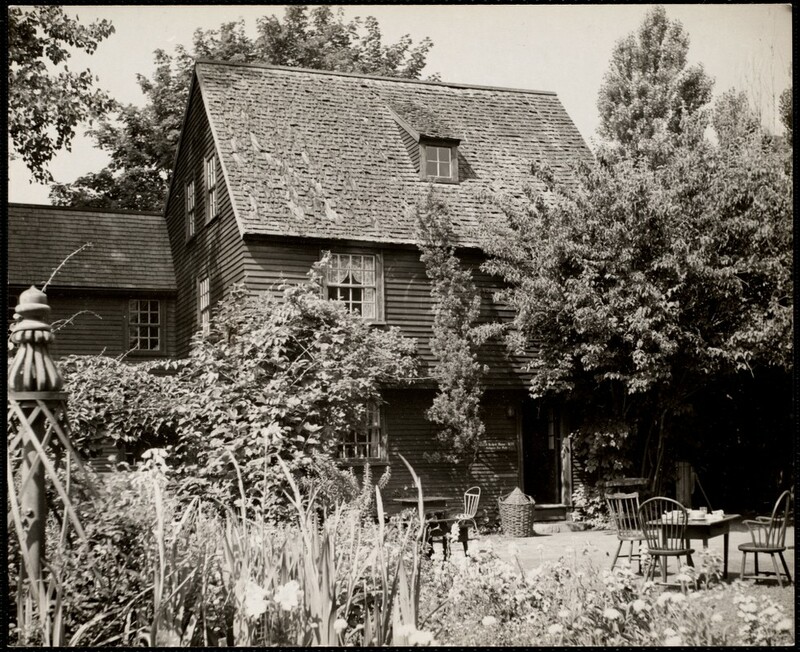 As a consequence of their choices, and my own indulgence in this blog, I have become much more aware of the availability of local historical resources, both in Essex County and beyond. Years ago, even before the Phillips Library was removed from Salem, access was so restricted that those students interested in researching Salem’s history were disadvantaged comparatively to those focused on other locales; of course now this disadvantage is even more apparent. Students (and everyone) interested in researching Salem’s history can consult the sources (primarily secondary and genealogical but also historic newspapers) in the Salem Room of the Salem Public Library and there are more archival materials at Salem State’s Archives and Special Collections repository in the Berry Library at Salem State. But surrounding our storied (but relatively sourceless!) city are active historical museums, societies, and archives, including the the Marblehead Museum, the Local History Research Center at the Peabody Institute in Peabody, the Danvers Archival Center at the Peabody Institute in Danvers, and the Beverly Historical Society’s Research Library and Archives. A bit farther afield and all around, there are local history centers popping up, many revived and reconstituted historical societies: just this month the Andover Historical Society has become the Andover Center for History & Culture, the Framingham History Center continues to expand its mission and initiatives, the Sudbury Historical Society is creating a new Sudbury History Center & Museum in the town center, and the Lexington Historical Society is building a new Archives Center adjacent to its Munroe Tavern this very summer. An Andover Market from the archives of the Andover Center for History & Culture; the Framingham History Center’s current exhibition. The grandfather of Massachusetts history centers must be the Lawrence History Center, the mission of which is to collect, preserve, share, and animate the history and heritage of Lawrence and its people. That is one great mission statement, and this very active organization clearly strives to fulfill it, offering a stream of symposia, educational programs, presentations, physical and digital exhibits and research services to provide access to and engagement with its archives. Their use of the word “animate” clearly does not refer to a diorama, wax figure, or haunted house! Lawrence textile industry strikers in 1912, Lawrence History Center Photographic Collection @Digital Commonwealth. 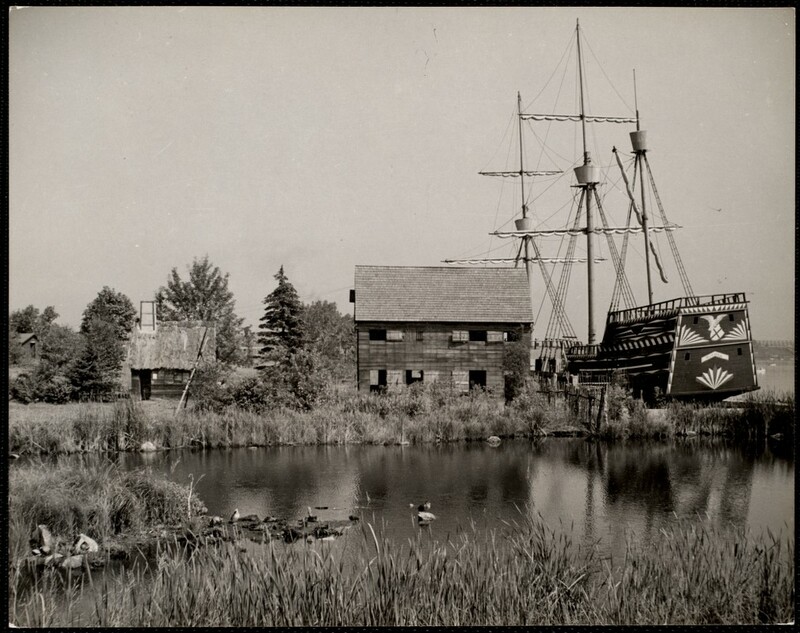 Appendix: Three upcoming events for local historians—the first in Salem! Finding & Sharing Local History workshop: May 31. The Massachusetts History Conference: June 4. Cambridge Open Archives 2018: June 11-15 & June 18-21. I promise: this is the last Phillips Library post for quite some time. It’s been six months since the Peabody Essex Museum admitted, under duress and only because they needed approvals from the Salem Historical Commission, that the Library was moving to a former toy factory off Route One in Rowley, Massachusetts. Since then there has been a public forum, lots of meetings, a succession of newspaper articles in the Salem News and the Boston Globe, a stern letter to the PEM from the President of the American Historical Association, and countless posts by me appealing, edifying, and scolding the Museum’s leadership. All to no avail: the Library–constituting a great part of Salem’s documentary history–is now in Rowley, and from what I hear (from a friend who is desperately trying to finish her Ph.D. dissertation–they didn’t tell her the Phillips was going to close last September either), is set to open sometime in June. Even the Google address (sort of) has changed, so that must be that, right? 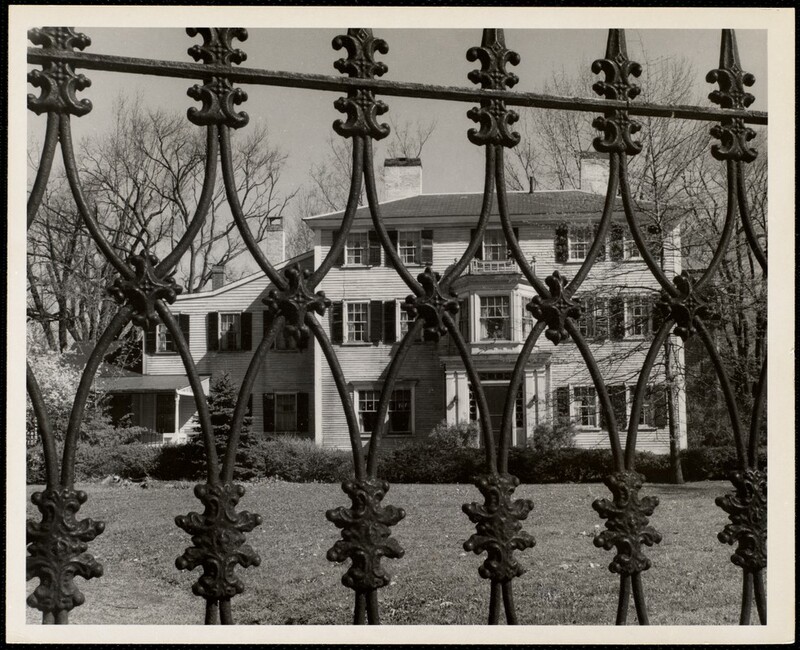 The address of the Phillips has changed but everything else remains the same: photographs of the interior and exterior, and its description: in the Essex Institute Historic District of Salem. If past practices are any indication, this half-correct entry will be up for quite some time: when the Phillips was moved to a temporary location in 2011 for the restoration of the building you see above, the address was never changed. And so I must say that the two men who are referenced in this entry—one visually and the other by name—are likely rolling in their graves after all that has happened. The photograph on the left is of Dr. Henry Wheatland (1812-1893) in one of the Phillips’ smaller reading rooms, around 1885. Dr. Wheatland dedicated his life to the Essex Institute, helping to found it through a merger of the Essex County Natural History Society and the Essex Historical Society in 1848, and serving later as the Institute’s Secretary, Treasurer, and President. As the finding aid to his papers in the Phillips Library asserts, Dr. Wheatland “devoted much of his life to ensuring that the Institute became a ‘permanent centre of influence for the enlightenment and instruction of the community'” and even continued to serve as its President after he was struck with paralysis at age 80, until his death. Wheatland was born in Salem and he died in Salem, and his will, like the wills of many donors to the Essex Institute and its library, left bequests to a Salem institution. I know he was referencing his desire that the Essex Institute’s library should be reference only in his 1893 will, but still: no books [should/to] be taken from the building except in extraordinary circumstances. The prominent and prolific Boston architect, Gridley J.F. Bryant (1816-1899), is another grave-roller, as he was the architect of the Italianate Daland house which has served as part of the Phillips Library in Salem for over a century and would certainly not want to be associated with the suburban industrial building that now constitutes the Phillips Library in Rowley. His name should be removed at once. One of Bryant’s more notable commissions: the Bigelow Chapel at Mt. Auburn Cemetery. Library of Congress. I can’t speak for all the people that put their trust in the predecessors of PEM, but fortunately it is a registered non-profit in Massachusetts and so its actions are subject to review by our Attorney General, Maura Healey. Several weeks ago a meticulous brief was delivered to her office formally requesting that the Public Charities Division review the actions of the PEM relative to the Phillips Library under Massachusetts General Laws, Chapter 12, Section 8H, regarding breaches of trust. The many “Friends of Salem’s Phillips Library” who have emerged over these past six months are sending letters in support of this brief and its request for review, and you can too if you like: Office of the Attorney General/Non-Profit Organizations/Public Charities Division/One Ashburton Place/ Boston, MA 02108. Contrary to what I reported here last week, the Working Group organized by Salem Mayor Kimberley Driscoll and PEM CEO Dan Monroe is still working: they will have more meetings. Their agenda still seems to be exclusively PEM-driven and they have a very odd understanding of what “collections” constitute, but they are still at work. It looks like the votes are there for the Salem Historical Commission to approve the demolition of the 1966 “Stacks” building at the rear of Gridley Bryant’s Daland House. Everyone agrees that this space was insufficient to store the vast collections of the Phillips, and it is rather inelegant, as you can see below. When the library was moved in 2011 to a temporary location to accommodate the renovation and expansion of all of the Phillips buildings, it became apparent that this addition was essentially unworkable, given the integrated structure of its construction. The PEM leadership implied that they just learned this in 2017, and so were “forced” to abandon all of the Phillips buildings (and Salem) altogether, but we have learned of several mitigating plans from the intervening years, including those which specified the construction of a brand new “stacks” building. In any case, the present Phillips buildings are not ready to accept all the collections at this time, primarily due to the poor planning of PEM. Rowley can be yet another temporary facility for these materials, but we are continuing to work to bring them back to Salem. The windowless “stacks” addition may soon be coming down. Salem News photograph. And what about digitization? The fact that the PEM is at least a decade behind comparable institutions in the digitization of its holdings has become common knowledge: the institution itself has acknowledged its deficiency by including “digitization priorities” on the limited Working Group agenda. There is some progress: I noticed just the other day that several records of the Salem Witch Trials have been added to the limited digital collections of the Library. The bulk of Witch Trial records were digitized a decade ago by a team of scholars and have been available at a (much more contextual) site sponsored by the University of Virginia since that time, but there are hopes that the well-endowed PEM will someday provide a global scholarly community with more materials which will elucidate this often-told story, and so many more lesser-known ones. I’m certainly moving on to other stories. After all, spring has finally arrived, the trillium are out, and there are places to go and more diverse and distant pasts to explore. If there are any new developments, I’ll post them here, but only if they are course-changing. P.S. And thanks for your patience—especially those of you who are perhaps not quite so interested (obsessed) with this issue! One of the benefits, or should I say privileges, of teaching at a relatively large public university is the opportunity to teach a fair number of veterans: given the length of the Iraq and Afghanistan operations this will likely be true for the rest of my career. And then some. It’s not possible to generalize about student veterans any more than it is about any other category of student, but I will say that those that I have had in my courses have been mature, engaged, focused: they don’t like to waste time. Everyone in the classroom profits from their participation–actually, even their presence. I’m looking forward to my post-chair life when I will be able to teach more in general, and teach more veterans in particular. And hopefully learn from them as well. I’ve always maintained a certain professorial distance with my students, but there are two professors who I know of, one a predecessor and the other a colleague, who have really engaged with students soldiers, amplifying their voices in very meaningful ways. During World War II, the chair of the Salem State History Department was Edna McGlynn, who organized a letter-writing campaign for Salem soldiers fighting overseas, resulting in the exchange of over 1400 letters and postcards, now housed in the University’s Archives and Special Collections. Also there are the “Salem News Letters”, edited summaries of all the letters she received, mailed out to the campus community and all those Salemites in service. All accounts indicate that Dr. McGlynn also worked tirelessly to help both World War II and Korean veterans transition into civilian and campus life once they returned from war. Just one letter to “Miss McGlyn”; Edna McGlynn (second from right) with the Collegiate Defense Committee, for which she was Faculty Advisor; A “Salem News Letter” from the spring of 1945, announcing the death of Joseph Hancock, Class of 1943, who is pictured in the yearbook from that year: all, Salem State University Archives and Special Collections. Flash forward 70+ years to the ongoing work of my colleague Andrew Darien, who has brought his decade-long work with Salem State veterans, encompassing several initiatives but best expressed by the “Student, Citizen, Soldier” project in which he has enlisted scores of undergraduate and graduate oral history students to document the varied experiences of veterans on campus and raise awareness of their service, sacrifices, struggles—and perspectives. Intended to foster a community dialogue on campus, this project now has a new website which extends its reach to everyone. I am struck by the continuity of purpose and commitment on the part of these two historians, separated by time and technology but united in their missions of enabling student-soldiers to tell their stories. Dr. Darien at work. On this Veterans Day, hear the stories of Salem State Student Soldiers in their own words at salemveterans.com. 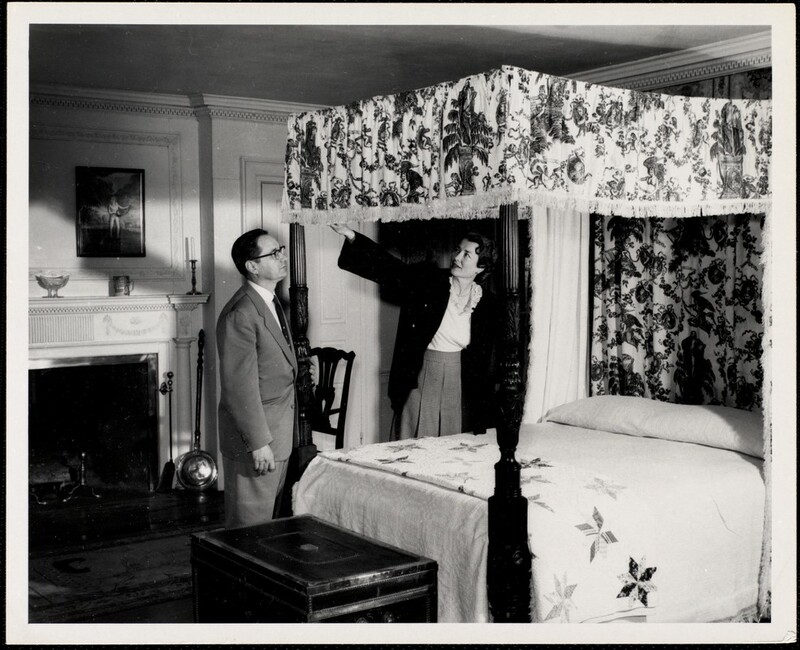 I have recently discovered the work of prolific Boston-area photographer Arthur Griffin (1903-2001), who was the exclusive photographer for the Boston Globe Rotogravure Magazine and photojournalist for Life and Time magazines for a good part of the twentieth century. There’s an entire museum in Winchester, Massachusetts dedicated to his work, and thousands of images have been digitized at the Digital Commonwealth. 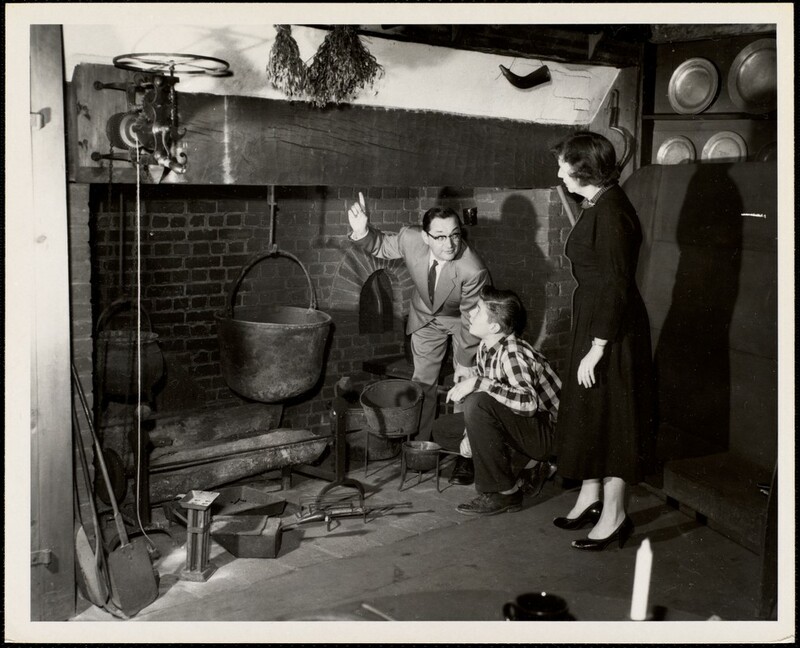 Griffin was a pioneer in the use of color film, but I love his black-and-white but still very bright pictures of Salem in the 1940s and 1950s because they depict a place that was decidedly not Witch City. 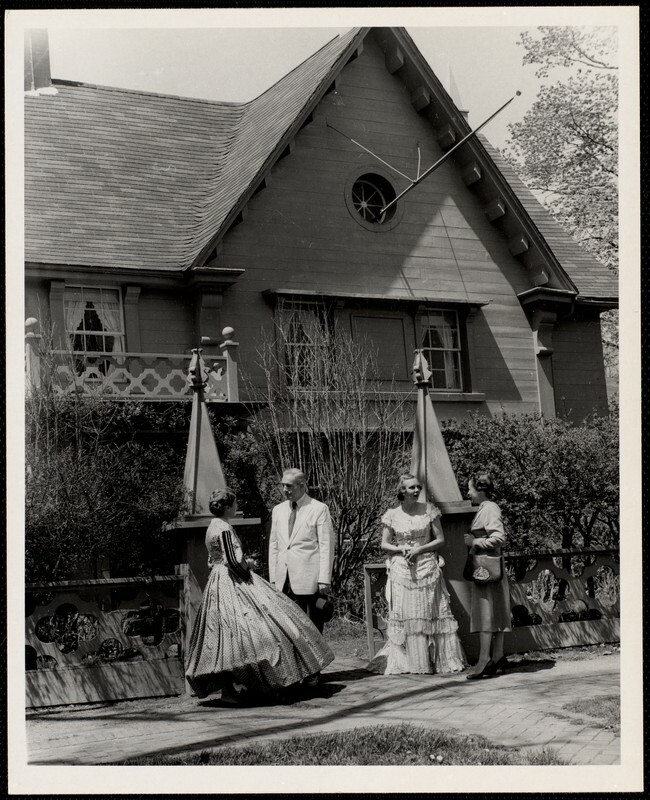 There’s not a witch to be found in his photographs of the perfect Pickering House, the various house museums of the then-Essex Institute (now Peabody Essex Museum) and the House of the Seven Gables: instead we see well-dressed tourists and guides garbed, for the most part, in “colonial” dress. 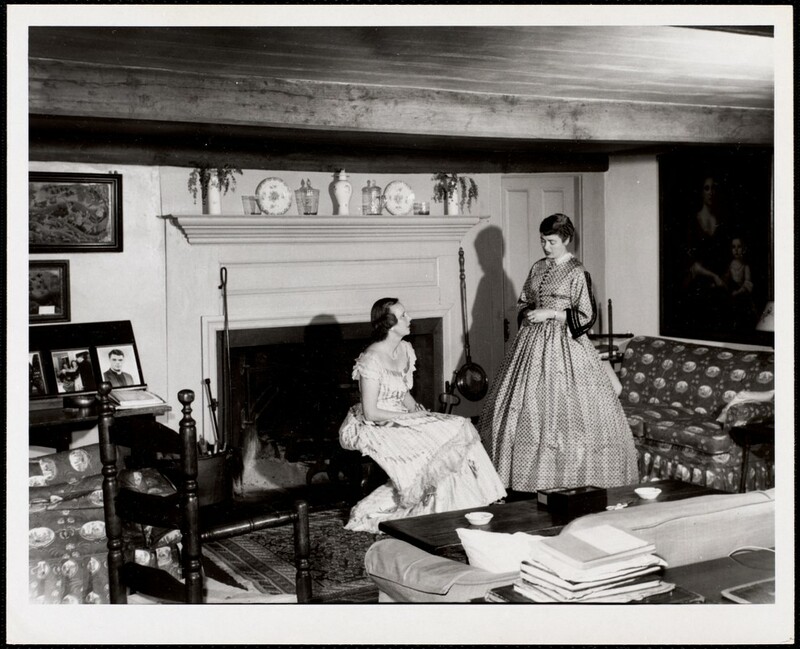 I always like to see occasions of colonial dress-up, and these photographs depict a decidedly mid-century display. 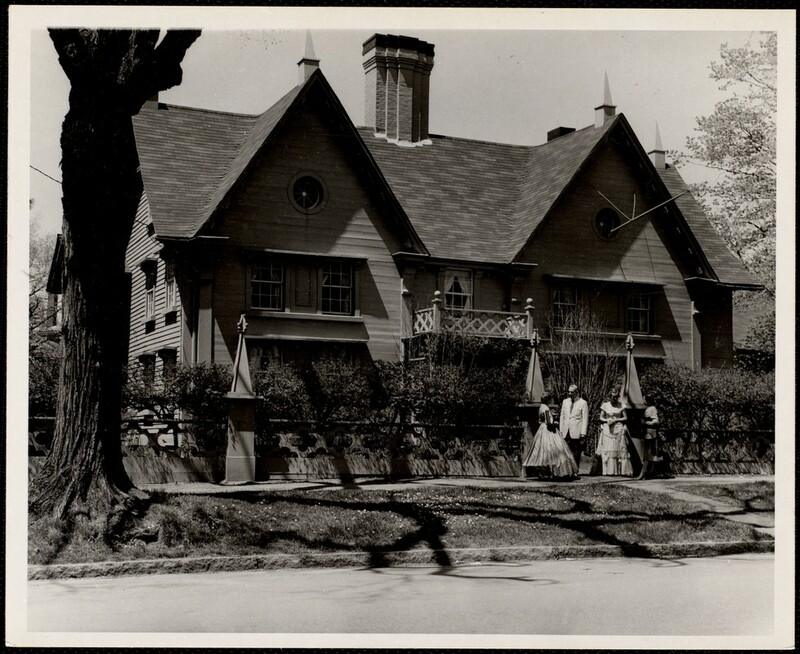 Visiting the Pickering House; Pioneer Village with the extant Arbella; the Retire Becket House at the House of the Seven Gables; inspecting the hearth and bed hangings at the John Ward House; a nice shot of the Solomon Chaplin House on Monroe Street.